Our team at E.M. Snow is happy to able to offer our exterior remodeling services to the Concord, MA community. 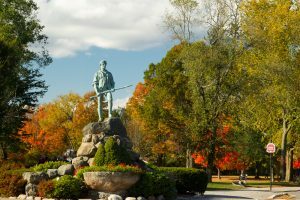 Concord, MA is home to roughly 18,000 residents spread out among 6000 households, so there are plenty of Concord residents in need of our remodeling services. Located about 10 miles northwest of our headquarters in Waltham, MA, we are very familiar with the Concord, MA area and have been assisting residents there with their exterior remodeling needs for years. Our team at E.M. Snow, Inc has been providing the Greater Boston area with our outstanding windows, siding, and roofing installation services for over 5 decades! We are honored to have established a reputation among Eastern Massachusetts homeowners for our exceptional installation services and our extraordinary craftsmanship and attention to detail. Interested in learning more about the services we have to offer to our homeowners? Look at the services we offer below! At E.M. Snow, we know how important your roof is to your home. It’s arguably the most important part of your home’s exterior, and we take care to ensure that your roof is installed with not a shingle out of place! Our team works with both asphalt shingles and rubber roofing, for our commercial clients. Unfortunately, due to the high volume of work we receive, we only install new roofs, as we don’t have the capacity to answer repair requests. If you need your asphalt roof replaced in Eastern Massachusetts, our team has you covered. We are proud to carry the CertainTeed line of roofing products. CertainTeed is one of the premier shingle manufactuers in North America, and we are honored to not only be able to install their products, but form a partnership with CertainTeed themselves. CertainTeed has recognized our company as a Select ShingleMaster, a certification that they bestow upon contractors that install their products as CertainTeed intends. We are honored to be acknowledged for our attention to detail and superior workmanship, and we will continue to provide our homeowners with a shingle that we trust! If you need your asphalt shingle roof replaced, reach out to our team today to get started! Siding provides numerous benefits for your home, including protecting it from the elements, increasing your home’s curb appeal, and providing your home with an additional layer of insulation. We know how important it is to keep your siding in good repair, which is why we are happy to be able to offer our siding replacement services to the Concord community! No matter what material you’re interested in installing, from the standard of the siding industry in the Northeast, vinyl siding, to an option that’s been gaining in popularity lately, James Hardie’s Fiber Cement, we have siding solutions for any budget or aesthetic preference. We are happy to be able to provide our homeowners with siding solutions that they can trust to protect the exterior of their home and look outstanding! Would you like to learn more about the exterior remodeling services that we offer to Concord, MA? Reach out to our team today for more information! We provide free estimates to our homeowners and we are ready to assist you with any of your exterior remodeling projects! We can be reached over the phone by calling us at 781-893-4546 or by filling out our online contact form.